Ottawa Senators defenseman Erik Karlsson has 35 points in 32 games, leading his team and NHL defensemen in scoring. The ability to produce points is one of the primary reasons Karlsson is again an early-season favorite to win the Norris Trophy. If he were to do so, it would be his third in the past five years. Nine players have won the Norris Trophy three or more times. More impressively, it would the third Norris Trophy for Karlsson by the time he finished his age-25 season. Two players have won three before his age-26 season: Bobby Orr (Boston Bruins) won the Norris Trophy for the third time at age 22 in 1969-70, and Denis Potvin (New York Islanders) did at age 25 in 1978-79. The award is voted on by members of the Professional Hockey Writers Association and is awarded to the "defense player who demonstrates throughout the season the greatest all-round ability in the position." The critics of Karlsson's candidacy always cite the "all-round ability" in the definition. They argue his ability to pile up points must cover up below-average defense and instead tout the candidacy of more classical two-way defenders Drew Doughty of the Los Angeles Kings, Shea Weber of the Nashville Predators, or Ryan Suter of the Minnesota Wild. Karlsson won the Norris last season and in 2012. In between, it was won by Duncan Keith of the Chicago Blackhawks and P.K. Subban of the Montreal Canadiens. But the oft-heard criticism of Karlsson is not valid. Consider what defensively weak puck-moving defensemen actually look like statistically. They are usually top options on the power play but are infrequently used to kill penalties. At even strength, they are disproportionately deployed in the offensive zone and when trailing in the game. A good example of a player who fits the offense-first description is Keith Yandle of the New York Rangers, whose underlying numbers are nothing like Karlsson's. Karlsson isn't a top penalty-killing option, but he has averaged 1:02 of shorthanded ice time per game since the 2010-11 season. It’s also possible his penalty-killing time is limited to save his ice time for other game situations. At even strength, Karlsson averages 21:59 per game, which is third in the League behind Suter (22:44) and Doughty (22:04), two players never accused of being weak defensively. On the power play, Karlsson averages 4:44 per game, which ranks second in the League, behind Oliver Ekman-Larsson of the Arizona Coyotes (5:33). With more than 27 minutes accounted for in those two manpower situations, there isn’t a lot of time remaining for killing penalties. Defensively weak defensemen are very rarely the top choice at even strength. For example, Yandle averages 16:51 per game, which ranks No. 5 among Rangers defensemen, just ahead of Dan Boyle, another offensive-minded defenseman. Yandle also is used more frequently when the Rangers are trailing. In Ottawa, Karlsson is the Senators' No. 1 choice in every score situation, as demonstrated in this chart by Micah Blake McCurdy of Hockey Viz. Karlsson is assigned at least 34 percent more ice time than any Senators defenseman other than his partner, Marc Methot. In theory, an offensive-minded defenseman could be assigned that much ice time on a weak defensive team that was without other options, but that's not the case in Ottawa. Since 2010-11, the Senators have allowed 2.79 goals per game, which is about the NHL average. 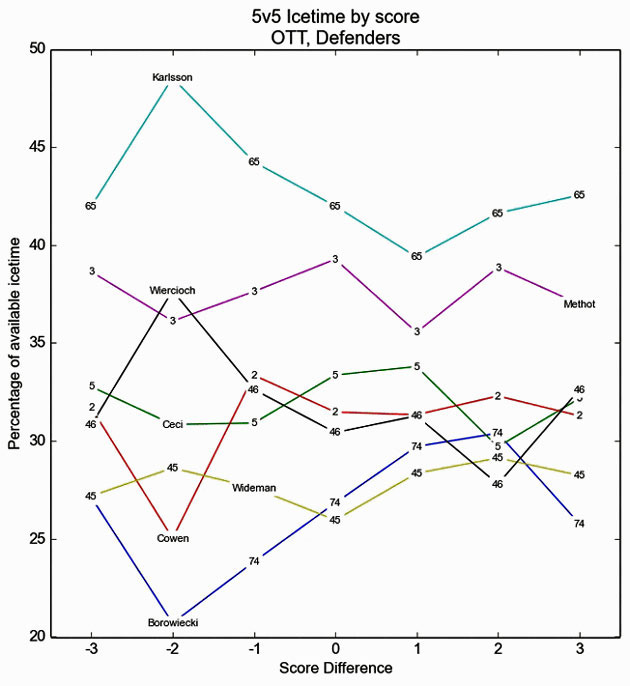 It's true Karlsson is used more frequently when Ottawa is trailing, and primarily in the offensive zone, but not by as dramatic a margin as other offense-only defensemen. Of those who started with a faceoff outside the neutral zone, 53.1 percent of Karlsson's shifts have started in the offensive zone, the highest rate among Senators defensemen. Yandle, to provide case-study contrast, has started 68.8 percent of his shifts in the offensive zone. Karlsson also faces the top competition regularly, regularly playing against top-six forwards in 5-on-5 play. Even when focusing on his defensive play, Karlsson's point production shouldn't be completely ignored. The most effective defensive play is to have control of the puck. Since 2010-11, the Senators have been responsible for 53.6 percent of all shot attempts whenever Karlsson has been on the ice, which ranks No. 7 out of 51 skaters to play at least 25 games for the Senators during that span. How can opponents score when Ottawa usually has the puck? Historically, even offensive-minded defensemen have won the Norris Trophy, provided they were sufficiently dominant with the puck. The best example is Paul Coffey, who won the award with the Edmonton Oilers in 1984-85 and 1985-86, and with the Detroit Red Wings in 1994-95. Offensively, Karlsson is as dominant today as Coffey was throughout most of his career. With 311 points in 368 games since the start of the 2010-11 season, Karlsson has outscored the next highest-scoring defenseman by 56 points, Dustin Byfuglien of the Winnipeg Jets. On a per-game basis, Karlsson's 0.85 points per game leads second-place Kris Letang of the Pittsburgh Penguins by 0.11 points per game. This season, Karlsson leads NHL defensemen with 35 points, which is four more than John Klingberg of the Dallas Stars. This is the third season Karlsson leads the Senators in scoring. This enormous offensive potential counts defensively too. Much like with Coffey, opponents have to guard against Karlsson's speed and puck-moving potential when he's on the ice, which prevents them from forechecking too aggressively, and keeps their purely offensive-minded players on the bench. The numbers all paint the same picture. Karlsson is not a purely offensive-minded player. He is trusted with one of the heaviest workloads in the League, and isn't sheltered from playing in the defensive zone, against top players, protecting late leads, or the occasional shift shorthanded. Furthermore, his incredible possession-based offensive play is a valuable defensive contribution in its own right. Karlsson may not share the same shut-down abilities of other multiple-time winners of the Norris Trophy, but that doesn't mean that he's a defensive liability. Simply, the Senators are a far more dangerous opponent to play against when he is on the ice.